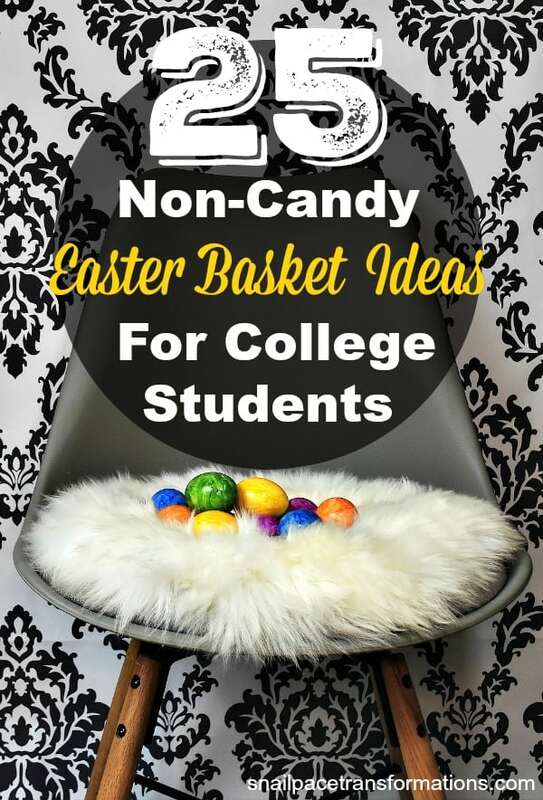 Do you want to send an Easter basket to a college student, but you don’t want the entire thing to be filled with candy? Here are 25 non-candy items for you to include. 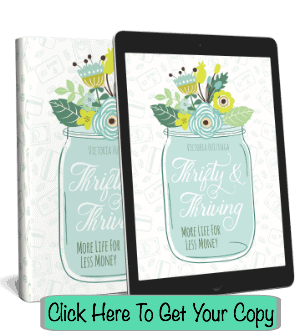 Of course, you don’t have to include all 25–just pick and choose which ones you know the college student would love and will fit your budget. With the popularity of frisbee golf growing a frisbee (or disc) is a great addition to an Easter basket. Got an environmentally and health conscious student on your list? How about a BPA free water bottle with an attached lid loop so it doesn’t get lost. If your college student doesn’t bring home his or her dirty laundry when they run out of clothes, then chances are they need quarters for the laundromat. Help them out by filling plastic eggs with some and placing them in their Easter basket. Gift cards are always appreciated by college students no matter what the dollar amount. 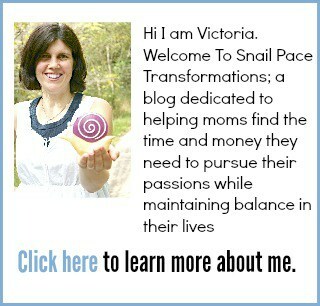 Did you know that you can earn gift cards while doing things you already do online like shopping and internet searches? Yep! Here is a list of companies that do just that. Since they are lightweight, inexpensive, and super handy, a USB Flash Drive is a great addition to an Easter basket you are planning to mail to a college student. 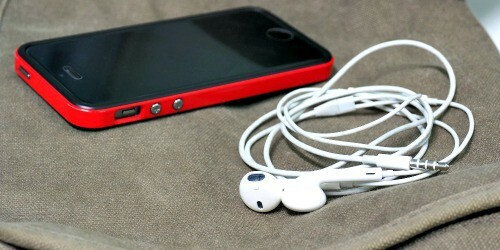 Another lightweight and handy gift is earbuds. Earbuds tend to either break or get lost pretty fast so even if your college student doesn’t need a pair right this second, chances are they will soon. Most nail polish lovers could always do with another shade of nail polish. My daughter really likes the Essie brand of nail polish. Lipgloss is another item that is needed and yet gets lost often. Okay, so lipgloss or chapstick might not be a need to a lot of people, but to most college students it is. Pretty much every college student nowadays has a smartphone so why not throw a few handy accessories in their Easter basket? A cell phone wallet that sticks to the back of either the smartphone itself or the case and holds up to three cards or two cards and cash folded up in the last slot. These PopSockets are popping up everywhere! They come in a wide variety of colors too. Are you looking for inexpensive smartphone service? Try Ting! The average customer with Ting pays just $23 a month. When I was in college my study notes were a fluorescent mess. Nowadays with the growing popularity of bullet journals, highlighters still make a great Easter basket stuffer for college students. These RFID money clips that also hold several cards are easier to store in a pocket than a bulky leather wallet and they protect you from having the information from your bankcards stolen. For something a little more feminine this coin purse with card holder and key ring would make a great gift. You could add a gift card or two to either of these and that on its own would be a great Easter gift. Well, you might want to add a bit of chocolate too! With bullet journaling being all the rage, you can get pens in just about any color imaginable and if your college student is a lover of all things stationary she or he will love any shade you pick. Of course, you could just make it easier on yourself and purchase a multi-colored pack. Even in this day an age of an app for everything college students still use sticky notes and flashcards on a regular basis. Add a pound of their favorite coffee to their basket or a package of coffee pods. Not a coffee drinker? Do they like tea? Get them a sampler so they can try out a few new types. Dorm rooms can get very smelly, scented candles can help with that. If you are shipping your Easter basket, get scented tea lights instead so you don’t have to worry about glass breaking in transit. Did you know that you can earn points towards magazine subscriptions through RecycleBank? It is pretty easy to earn enough points for one too. Pick out one that matches the interests of your college student and address the subscription you earn to them. Coloring is a great way to soothe away study stress so why not add a new coloring book to your student’s collection? If you are throwing in a coloring book, new pencil crayons make a great companion. Laughter is another great stress reliever so toss a comic book in that basket. These carabineer keychains are pretty handy. Your college student can use them to clip their keys to just about anything. A classic blank notebook can be used for thousands of different things, from note keeping to bullet journaling and more. No one can ever have enough coffee mugs. Especially ones with funny or thoughtful sayings. Exactly where do the bobby pins and hair elastics we buy disappear to? It is an age-old question. Help your college student out by including a fresh supply in their Easter basket. Flip flops are great for summer and for showers in dorms. They tend to wear out rather quickly so new flip flops are always appreciated by those that love wearing them. Can one really have enough sharpies around? Sharpies are especially handy for studious college students. Or for those who love to get creative between classes. Do you also have teenagers on your Easter gift list? 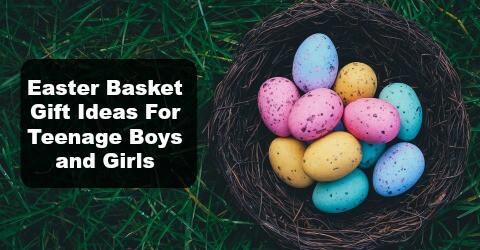 Then check out my list of Easter basket gift ideas for teenage boys and girls.